Topkapı includes a number of different types of buildings within its walls, and all of these were described in detail by our guide. The Kitchens were one of the early stops on route where, rather than feeding the five thousand, when these were working at full capacity during the Ramadan festival, they catered for 15,000 of the local poor and needy. 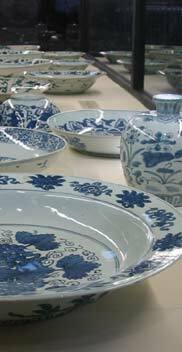 Now, though, it was being used to show off a large collection of Chinese ceramics. Passing through the Gate of Felicity, we saw some restoration work going on as primer was applied to some of the flourishes, just waiting for the gold leaf (or gold coloured paint, which is more likely given Turkey's soaring inflation rates). Then on past the Sultan's receiving room, we continued to the Tulip Room (I believe it was called), or rather we stood outside it and looked over the Bosphorous Sea, taking in the numbers of tankers going about their business. It was a very hazy day, but our guide pointed out various landmarks in the distance to us, including the Maiden's Tower. The Baghdad Pavilion came next - an extremely ornate and very small room (one might almost call it a folly). The Islamic tile work was beautiful, and there was a guide on standby to make sure that no-one decided to take away any souvenirs. In the Privy Chamber of Holy Relics, we saw various swords belonging to the ancient Caliphs, treasured models of mosques such as that at Medina and a number of other valued relics that are significant to Muslims. In one room, which was crowded (with people, not relics), a man was sat in one corner in a booth reciting pages from the Koran over the loud speaker. It was all very melodious, if you like that kind of thing. I tried to film the scene with my camcorder, but was told off first by one woman who told me that I cannot film and that they would confiscate the film. Then I got clarification on this by the guard who began gesticulating wildly in the general direction of myself and another Muslim woman whose camera (and camera-work) was somewhat more discreet than mine. Thankfully, I didn't get the film confiscated. We had lunch at The Pudding Shop in the Sultanhamet district. The shop has been there for years and has a reputation as being one of the start points on the hippy trail through Asia - a good place to get a good feed before discovering the culinary delights that await in India and so on. Despite the title, it does actually sell meat products - it's not really a place to get stuffed on Angel Delight. Chinese porcelein collection in the kitchens, Topkapı Palace.